What does reviewing a transaction do? Why can't I bulk edit certain transactions? If you made one lump sum payment for a number of items that belong in different categories, or if a customer paid you a single check to cover several invoices, you'll need to split the transaction and account for each part separately. 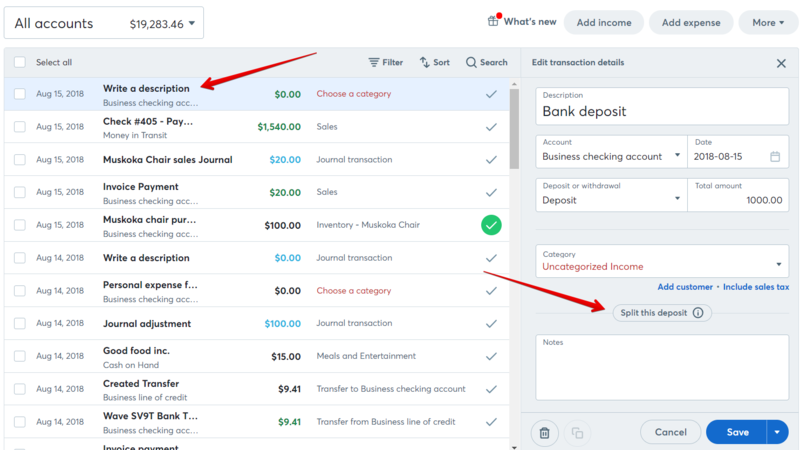 Click on Accounting in the menu on the left side of your screen and select Transactions. From your Transactions list, find the one you want to split and click the arrow to the far right of it. Choose Split transaction. You'll now have two splits for your original transaction, each with entry fields for a Description and Amount. Enter a different Description for the first if you wish, and an Amount. You'll notice that the Available total automatically updates, showing you how much of the original transaction is unaccounted for. Enter a Description and an Amount for the second split. If you want to split the transaction more ways, click on Add row. A new line will appear. When you are finished, click Split transaction. You can split a transaction as many ways as you need. The only requirement is that all the splits have to add up to the total of the original transaction. You can keep track of how much is left by the Available message. In your Transactions list, each of your splits now appears on its own line as an individual transaction. You can now categorize each item where it belongs. If you uploaded a receipt and the bank imports the same transaction, or if you have duplicate transactions you'll need to merge them to reconcile the duplication. From your Transactions list, find the transaction(s) you want to merge and click on the checkbox to the far left of them. Choose Merge transaction. Select the transaction you wish to split. Navigate over to the right details view and scroll down until you see a button to Split this Deposit (or Withdrawal). Enter the amounts accordingly. Remember, the total of the splits must equal the transaction total. Don't forget to click Save!